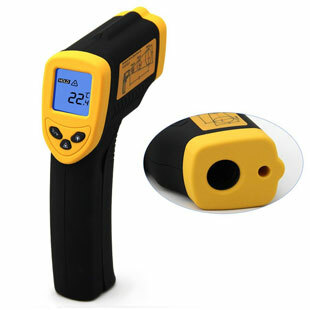 Many of us are familiar using an instant-read, infrared thermometer for getting instant temperature readings around the house: AC and Heating vents; windows and walls; leaky window seals; and other ways to make our homes energy efficient. It's great for moms that want an instant temperature read on car seats or bath-water! Cold and warm spots in the fridge; best place to store the wine in the basement; the uses are certainly far and wide! However, it's the Kitchen where we cooks wish to be accurate! If you fry chicken or fish; saute vegetables or stir-fry then you know how invaluable it is to have the proper temperature. Checking frying oil to make sure it's at 375 degrees Fahrenheit for best deep-frying results! How about the burner or weekend bbq grill? Is it hot enough or too hot? Make sure your pan is above 200 degrees Fahrenheit and below 300 degrees Fahrenheit before scrambling eggs! Remove the guesswork and get accurate readings! Keep this handy tool in your kitchen and it's sure to be one of your best investments! Red laser pointer for precise aiming. Instant-read with less than 1 second response time. Fits easily in a pocket or purse. Ultra-portable; Easy to carry everywhere.